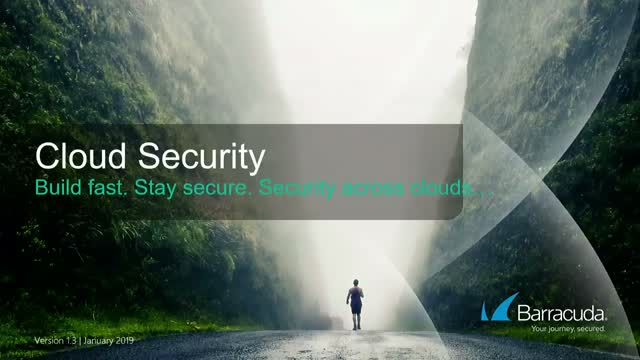 A technical discussion of how the approach to security within public cloud is evolving and what products and tools can help ensure you have the awareness and protection you need. Defending your business against social-engineering and phishing attacks is crucial in today’s cyber landscape. Although your users may pose a high security risk they can also act as an additional layer of security by training them to be ever vigilant and to recognize the subtle clues of even the most cunning phishing attempts. On this Video Meetup we’ll talk to an IT Pro from the Spiceworks Community about implementing and managing a security awareness program within their organization and the lessons learned. We’ll also be joined by an expert from Barracuda to discuss how to best protect your company and train your users to be on the lookout. How to design and implement a security awareness program that uses positive reinforcement to embed effective practices through out every business process. The importance of identifying the human risk factor through security surveys and testing utilizing the most up-to-date simulated phishing and social-engineering campaigns. How automating your incident response can keep attacks from spreading through your organization, including sending alerts to impacted users and removing malicious emails directly from their inboxes. Infosecurity invites Asaf Cidon from Barracuda Networks to deliver a presentation on the latest issues and challenges affecting them and their customers in the information security sector. One of the challenges with public cloud environments is the rate at which they change. Yet the ability to change / grow elastically is one of the key advantages to adopting public cloud. Complicate that further with a multi-cloud environment and you quickly find yourself lacking the ability to visualize your infrastructure, drill down into detail, gather resource level information and understand the relationship and interconnectivity of those resources and how they affect compliance and your security posture. Gartner has predicted that “Through 2020, 80% of cloud breached will be due to customer misconfiguration, mismanaged credentials or insider theft, not cloud provider vulnerabilities”. So how can you ensure your organisation not only has complete visibility of its cloud infrastructure but is also securing its workloads and apps and being compliant? Is it really an impossible task? 2018 saw some great strides in cyber security as well as some major breaches. Will 2019 be the same? As we all try and stay one step ahead of the attackers and look into our crystal ball on what the future holds, Barracuda wanted to see how our customers and channel partners feel about the past, present, and future of cyber security and how their approach has evolved over time. We surveyed more than 1,500 IT leaders and security professionals in North America, EMEA, and APJ about their IT security priorities, how those priorities have shifted, and where they’re headed next. Register today to find out what your peers believe will be the key trends in cyber security and advice on how to stay ahead of the attackers in 2019 and beyond. Cut through the noise around SD-WAN. Join us for this all-new webinar, where we’ll dive into the eye-opening results of our recent global survey of IT administrators. Find out what 910 of your peers around the globe are thinking, saying, and doing about the move to SD-WAN—and understand how attitudes and trends in the EMEA region differ in some respects from those in other regions. Don’t miss this opportunity to gain a firm, practical understanding of the main SD-WAN concerns and challenges that your peers are dealing with, and how they’re achieving the right balance of WAN performance and security. Attend this important live webinar and get the insights you need to make the best SD-WAN choices for your organization. With the rise in cloud services along with remote and mobile users, Software-Defined WAN technology can act like the Force to help optimize your WAN and troubleshoot issues with as little sysadmin/Jedi intervention needed. Did you know email is still the biggest threat vector for phishing, with 74% of threats entered as an email attachment or link? Does your email protection do enough to help prevent your users from being phished? On this webinar you’ll learn how a multi-layered next generation email protection solution not only addresses the latest email threats but helps you stay ahead of the curve. How advanced threats are evolving to use sophisticated techniques such as spear phishing and social engineering. The different layers needed in a next generation email protection solution. How you can get started today. Knowing which threats are trending right now—and which vectors criminals are using to attack you—is the key to optimizing and fine-tuning your security policies and solutions for effective protection. Register to learn the fastest, easiest way to get the information you need to stay ahead of the biggest cyber threat trends. Did you know that around 90% of all hacks start with a targeted email attack? Protect your users and their data and assets from the biggest security threat there is: themselves. Join us for a video meetup where we’ll discuss the multi-layered security strategy you need to maximize your protection and minimize your risk. It’s not everyday you get the inside story on how a group of cybersecurity researchers stumbled upon an APT, an advanced persistent threat, when they were examining the intelligence data from their security kit. It appeared harmless and boring but of advanced attributes. But Fleming Shi and Jonathan Tanner suspected something was amiss. Facilitated by Amar Singh, practising CISO, on this exclusive webinar as he unpicks what Fleming and Jonathan did next. Their curiosity got the better of them and they set about tinkering to discover the true intentions of this benign malware. Microsoft Office 365 is so ubiquitous-with more than 100 million monthly active subscribers-that it's almost become part of our identities. Cybercriminals have taken notice-and Office 365 has become a breeding ground for an increasing number of highly sophisticated attacks. Wie manage ich Security und Konnektivität in hybriden Umgebungen? Wie erweitere ich die Sicherheitskontrollen vor Ort auf öffentliche Cloud-Plattformen? Wie kann ich Anwendungen sicher in öffentlichen Cloud-Umgebungen zur Verfügung stellen? Live demo of how to Dynamically Secure Cloud Infrastructure. The title says it all folks - we are going to talk about what's broken in the cloud and do a demo of why it is so easy to break down the current security infrastructure that most companies deploy in the cloud.